Crossroads Woodbridge is an elegant property surrounded by greenery, located in DLF Phase 1, Sector 28, in Gurgaon. It is close to Kingdom of Dreams, Aravalli Biodiversity Park, Sikanderpur metro station and MGF Megacity Mall. The property boasts of a well-maintained garden and green lawn, with tall trees and pebbled grounds. There is a kitchen on the premises as well as a modern dining area. The rooms are bright, furnished in a modern manner, are spacious, and feature paintings. They come with seating arrangements near windows. 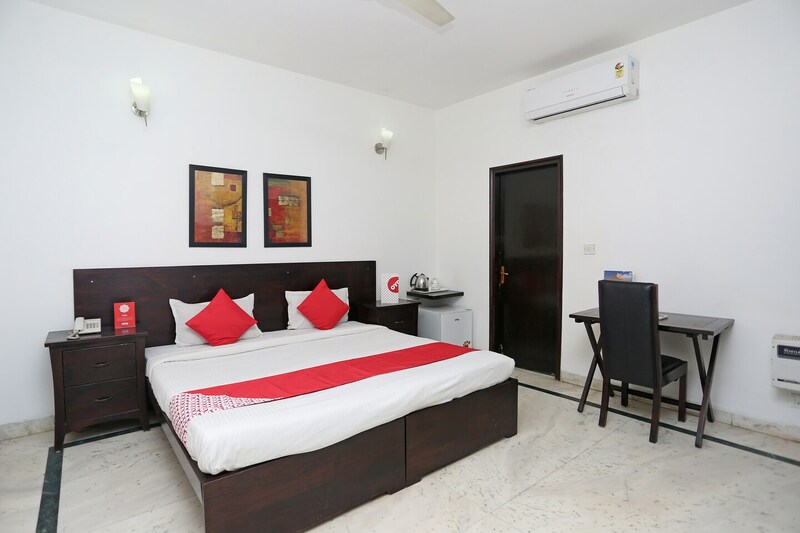 All the rooms are equipped with TV, AC and mini fridge. The bathrooms are stylish and neatly tiled. The property offers free Wi-Fi, card payment facility, CCTV security and laundry services as well. Enjoy authentic Indian meals at close by restaurants like Moti Mahal Delux or Kilo Kitchen Biryanis & More. 7 Barrel Brew Pub, Sibang Bakery and Palmyra - The Bristol Hotel are some other eateries and cafes.